Well, my ISP, Software Tool and Die, is suffering networking problems from an ill-executed network cutover. If you've sent me e-mail over the past two days, send it again, please. 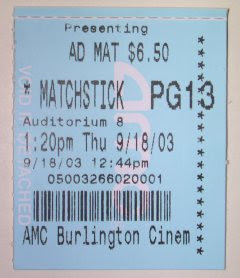 This afternoon, on a matinee, I watched Matchstick Men. This movie is an adaptation of Eric Garcia's book, Matchstick Men. Two things contributed to Matchstick Men being September's movie (my ninth movie in a theater): Eric Garcia and Ridley Scott. Eric Garcia occasionally posts on the USENET newsgroup misc.writing.screenplays, a newsgroup I dip into every now and then when I want to see how writers write when they're procrastinating. Eric has clout in the group because he's published, and his novel was made into a movie. He got good buzz. Eric's on-line demeanor is engaging and friendly, and he welcomes all correspondence to his e-mail. When I heard a book of his was going to be a movie, I bought it. I devoured the book in two evenings. It was splendid! A very fast paced book, the twists and turns were stunning, and by the end of it, well...let's just say I thought it was a very brave ending! Ridley Scott is the famous director, of course. He's the man behind the vision of such films as Black Hawk Down, Gladiator, Blade Runner, and Alien. Ridley Scott's movies are gorgeous. I'm not enough of a film student to able to dissect exactly why, but I'm enough of a movie fan to know that I very much like how puts a movie together. Ridley's DVD commentary on Alien was the first DVD commentary I ever listened to. In a recent article, Ridley was joking that "I'm old, but I can still beat the pants off any 22-year old tennis pro", referring to today's younger directors. It then occurred to me that I haven't seen a Ridley Scott movie in the theater since perhaps Thelma & Louise. I have seen Alien and Blade Runner in college, but I missed his modern spectacles Black Hawk Down and Gladiator. Knowing the story line for Matchstick Men, I was eager to see what he'd do with it. Guess what? He did the story pretty well! It's a movie to definitely go see. You'll see a "tone" that is uniquely and unmistakably Ridley Scott. You'll see some very showy (and to me, very cool) editing by Dody Dorn. Nicolas Cage gives an eye-popping performance. And screen writers Nicholas Griffin and Ted Griffin do all right by Eric Garcia. Look, readers. There on the left hand side of the page. That's me! I took the photo with my digital camera (which I can rotate to take a self-portrait). I thought it was high time to have an image of me on these very pages. Maybe it'll affect the way you read this page? Maybe some of you will recognize me? Either way, I have been meaning to add a picture to this BLOG for some time. And while I was at, I put another picture of myself on the archives page. I hear the sound of an airliner overhead, queuing up in the airspace approaching Logan Airport. It's a sound that has the low bass of foreboding, thanks to the events from 9/11/2001. There's another one, more distant. Business as usual, it appears. For the past few evenings, I have been trying to write a nice little piece welcoming all the new college kids coming to Boston. I was going to write about all the nice places to visit in and around town. 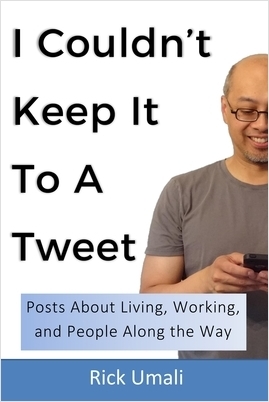 I then thought about writing some unsolicited advice ("carry a pen", "learn the names of people who serve you", etc.). But I couldn't get the words going. And now I know why: I'm jealous of all the new college kids coming to Boston. I wish I were you. Young. Relatively care-free. Raring to explore a new city, a new environment (college!). You kids are lucky. Boston is a tremendous city to study in, to spend college time in. And college is indeed a special time. I guess at the time, I tried to maintain a nonchalance demeanor. Maybe you do too. But know this: You will never have the kind of time you have now, ever again. When I was in school, all roads were open. All paths were welcoming me. And I had the energy and the freedom to look down all those roads, walk down all those paths, at least for a little while. At least until I realized that maybe another path was for me. The path I'm on now. So welcome to Boston you new kids on the block! Make sure to visit Fenway Park. Walk the Freedom Trail. Explore your college campus, and find a quiet place, a quiet nook that only you know about. Make sure you socialize once in a while in school. Learn how to find yourself. Make friends. You won't make these kinds of friends again. I promise you that. There's time enough for the future. Live your college lives fully!